As protests continue in Bahrain, access to many websites has been restricted there. Arbor Networks, a security research company that tracks Internet traffic, told The NY Times on Friday that traffic into and out of Bahrain has dropped between 10% and 20% below expected levels. Traffic normally only drops that low during natural disasters or global sporting events. 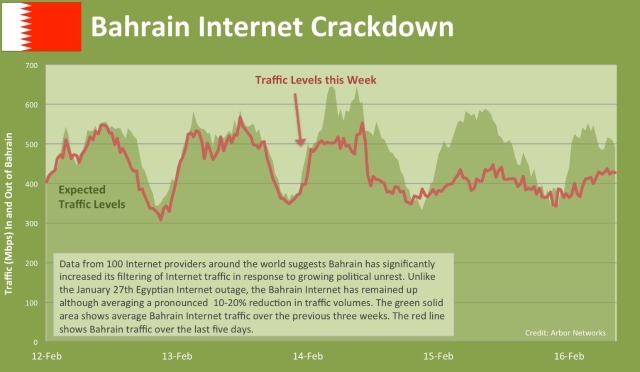 The graph below shows Bahrain’s Internet traffic levels this week compared to average traffic levels during the previous three weeks. The traffic this week has been significantly lower than usual. Arbor Networks told The Times that it couldn’t absolutely rule out technical difficulties as a cause for the drop, though the most likely cause was blocked websites. Last month, Egypt blocked websites like Twitter and Facebook in response to unrest before blocking the Internet altogether. The success that Egyptian protesters had in ousting former president Hosni Mubarak despite these drastic digital measures is often cited as enhancing the confidence of protesters in Bahrain, Algeriaand elsewhere in the Middle East. While data suggests that Bahrain is restricting the Internet in response to unrest in the same way Egypt did, Arbor Network’s Internet traffic data shows nothing out of the ordinary in Algeria’s Internet traffic (at least between February 10 and 13).